It has been proven repeatedly that physical, promotional items are one of the most effective ways for customers to remember your brand and view it favorably. It's so effective that one study found over 90% said they don't forget the company that gave them the product. 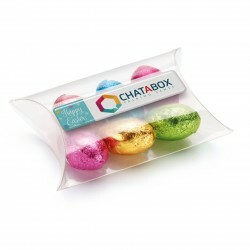 When you combine this knowledge with the fact that sweets like chocolate have been shown to improve people's moods and help them feel happier, it becomes clear that Easter sweets are a great way to promote your company. 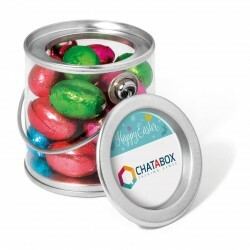 Sure, you could printed sweets at any point in the year, but Easter is a special occasion for many of your customers which makes it an ideal time to do something special for them. When your company is getting ready for Easter, be sure to keep the following tips and advice in mind. If you're a financial company, think wider about the type of promotional items you could use, rather than just choosing pens or mugs. The items you choose to give away should be fun and also reflect what your company does. Your customers will never forget about it and possibly even mention it on social media. For example, you could offer customers the option of taking one chocolate coin now or "investing" it for the future. If they choose to invest then you simply ask them to return after a few minutes and reward them with a small pouch of chocolate coins with your logo on it. Think about your business and how you could do something relevant and enjoyable. 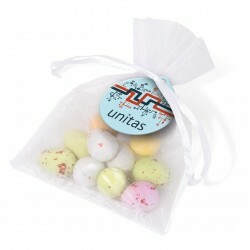 When customers interact with your business it always helps to surprise and delight them. Telling a customer that just walked into your store that they should look for gifts or treats around the store will make their shopping experience so much greater. Again, the more relevant you can make it, the better. If you have a gardening store, for example, you could literally plant these cute carrot shaped bags in pots around the shop for adults and kids to "harvest". 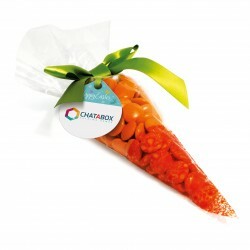 Easter-themed giveaways should be just as fun for you as they are for your customers. 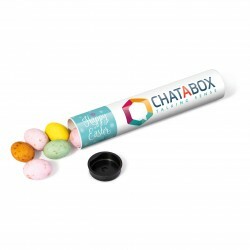 For example, rather than just handing out an Easter mini bucket when customers make a purchase, you can make a game of it. Put one of the buckets behind you or away from the customers and ask them to guess how many chocolate eggs they think are in the bucket. Those who get the answer right will win their own bucket as a reward. The idea is to create experiences that make people smile and laugh. When they eat the chocolate eggs later, they will remember your brand favorably and will likely choose to shop there again. 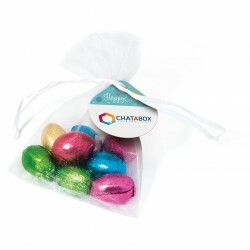 The possibilities for Easter giveaways are endless so get your team together and spend some time coming up with ideas. Be sure to keep an open mind and have fun with it. Often, a really dumb idea said as a joke can inspire a really cool and different execution. 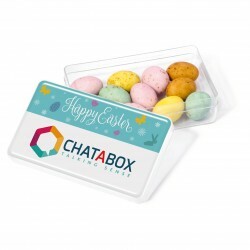 For inspiration, take a look through our Easter-themed sweets and other merchandise to see which giveaway item is the best for your business.